In a world of fast moving and disruptive technologies, mobile technology has the potential to emerge as one of the biggest game changers. 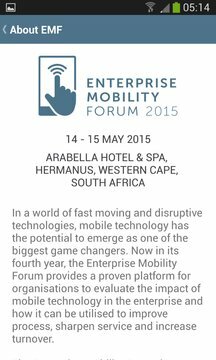 Now in its fourth year, the Enterprise Mobility Forum provides a proven platform for organisations to evaluate the impact of mobile technology in the enterprise and how it can be utilised to improve process, sharpen service and increase turnover. 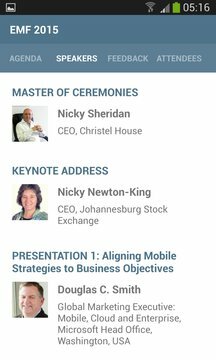 The Enterprise Mobility Forum is a yearly exclusive event targeted at senior executives and decision makers and is strictly by invitation only. Its unique formula, high quality locations and quality of speakers and delegates brings together the most important enterprise mobility vendors in sub-Sahara Africa, industry analysts and a diverse and targeted set of technology end users.